It was easier to begin my 45-minute looking experience at William-Adolphe Bouguereau’s Homer and His Guide than it was at Ernst Ludwig Kirchner’s Street at Schöneberg City Park, the subject of my last “Slow Art” post. I have loved Bouguereau for about four years now, ever since I gave gallery talks on his work at the Frick Art & Historical Center in Pittsburgh, PA. Like Jean-Honoré Fragonard, he is not the most respectable artist for an art historian or museum educator to love: his work is sentimental, it doesn’t really push boundaries, and it is on the whole pretty safe. But I have always been drawn to the way he paints–his style is luminously realistic, ridiculously meticulous. He is one of the few painters whose figures always seem to me about to jump off the canvas. Not wanting to care quite yet about the painting’s content, I let its monumental size take over. 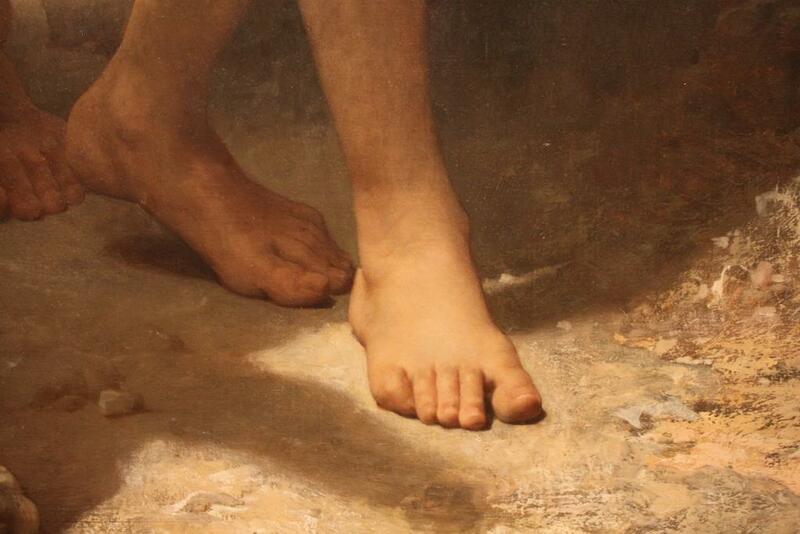 The angry dog barks in the foreground; the idealized shepherd boy, with his worried brow, steps forward with one of the most perfect feet in the entire Museum. Homer stands somehow separate from them, his stature taking over. I begin to drink in the textures: the rough, marble-like canvas of Homer’s tunic; the soft, plush fur at the neck of the dog that I want to run my fingers through; the crumpled, thin fabric of the shepherd’s clothing; the scratched, dusty ground at his feet; his curly mop of hair; Homer’s bristly beard; the velvety leaves of the trees and bushes around them. And their skin–that flesh, translucent and soft looking, as if blood is coursing through veins underneath paint. There’s a point in these long looking experiences, I’ve noticed, when the going gets tough. It’s around 10 or 15 minutes in. I get fidgety, I get a little cranky, I want to give up. I’ve run through all the basics that I know about the piece (the bits of information about the artist I already know, the basic story behind the piece, the style and time period). I’m feeling like I’ve got the gist of things. But that’s the point when it’s really important to keep looking. I usually change my position to get a fresh perspective. Then things begin to open up a little more. I start by getting closer, selfishly wanting to figure out how Bouguereau could possibly paint this way. I see thorns and berries in the bush on the left. 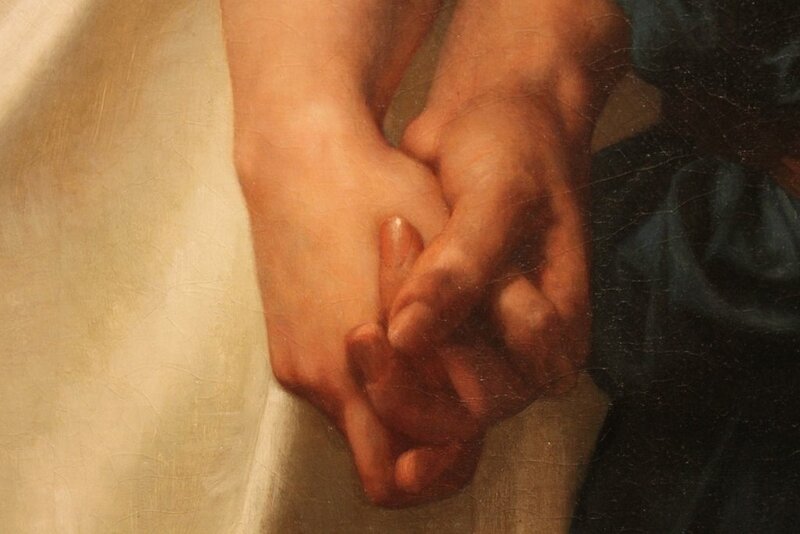 I look closely at the intertwined hands of Homer and the shepherd boy, noticing how Homer’s hand is palm upwards. The bard’s fist tensely clenches around his walking stick, and I feel the pressure he places on it as he moves forward. I think of the power and influence Homer has and had, and yet how, because of his disability, he also must have needed to be dependent, vulnerable at times. It must have been difficult for this man, proud chin held high. Meanwhile, I am still struggling–getting closer hasn’t helped change my sudden moodiness with the painting. Gallery view--this is the angle where everything started to make sense. So I straighten and take some big steps backwards, moving to the right to get rid of the glare from the gallery lighting. The colors immediately seem even richer, and then the composition clicks. 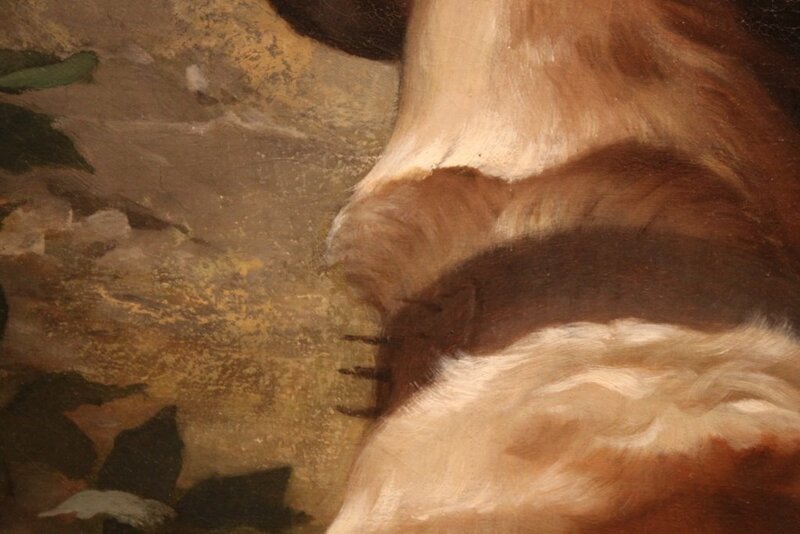 The painting is divided into two halves. On the left, there is danger: wildly gesturing naked youths (other shepherds, oddly undressed in the fields? ), more angry dogs, a thorny bush, and the huge barking dog in the foreground. On the right, there is safety–the hand of the helpful youth, a flowering tree, an empty basket, a pathway onwards. Homer, tall, head held high, straddles the two. The lute on his back, tied with a bright orange sash, and the walking stick are Homer’s only accessories. The lute, instrument of the Greek poet, symbolizing creativity, his life’s work–it is comforting, a tool he knows well, but it is also dangerous, just like the act of creating art is a frightening thing. He must straddle danger and safety, I realize–isn’t that what creativity is all about? Giving oneself over to both the danger and the vulnerability of art, whether painting or poetry or music, is how meaningful works are created. 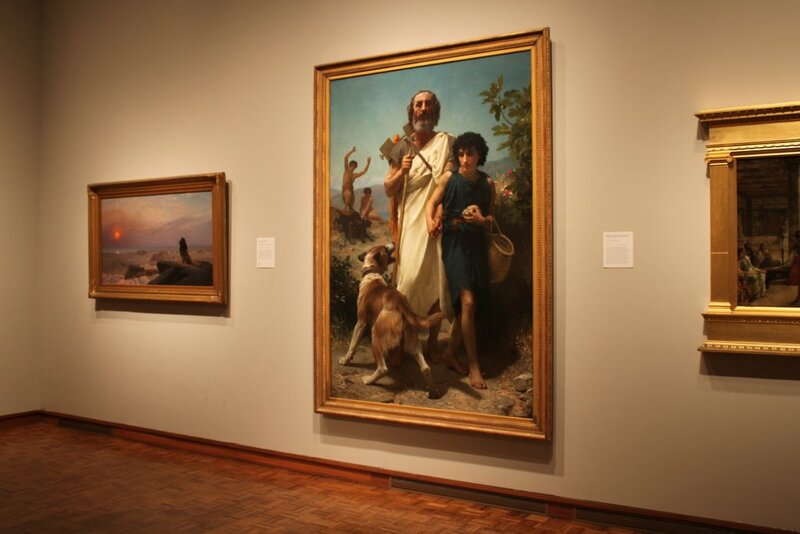 You can visit this painting in Gallery 10 on the Main Level. Are you equally as enthralled by Bouguereau’s painting style as I am, or do you find it a bit too sentimental? Do you agree about the statement I think the artist might be making about creativity? Share in the comments! This entry was posted in Art, Education and tagged 19th Century Art, French Art, Homer, Slow Art, William-Adolphe Bouguereau. Bookmark the permalink. Thank YOU for the kind words, KDM. Nice to find another Bouguereau fan! 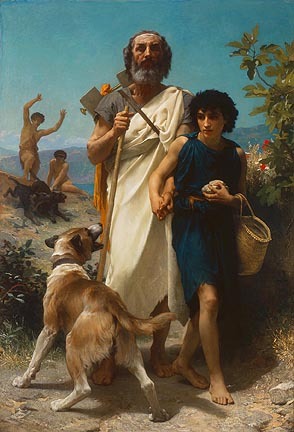 I always have enjoyed this painting since I was a kid, I always enjoyed Homer’s poertry/stories because it always manage to find my way back up to my steps. =) this was an amazing artical and I really loved reading it. Thank you so much for posting this because it really made my day…thank you much. Hi Angel, your comment made my day! Thank you! Thank you for your comment, John! I love revisiting works that I’ve known for years–I hope you’ll come in and do that with our Bouguereau. Like many have done before me, I am attempting to copy a Bouguereau. The more I look at his work, the more I am humbled by it. He was a great master of art. I agree, Bouguereau’s can be a bit sentimental but I think that anyone who gets hung up on this is missing the whole picture. Not every artist is going to tackle the same themes as others. It’s like saying that Raphael was a bad artist simply because his paintings were almost all religious and didn’t tackle the psychological or the uncanny. Looking at Bouguereau without comparing him to other painters will make it obvious that his great appeal (and perhaps his intent) is in the way he pushed the technical. I can’t imagine him not having fun with his process…getting that thrilling rush of satisfaction as a glaze modified a certain area to just the right color temperature or value. More than his subjects, I enjoy the fun of just looking at his paintings and being drawn to that painted world that looks as if I can walk right into it – and I think Bouguereau would have been just fine with that. This is really amazing…. very detailed……..thank you !!!! Nice article. I would like to enhance the dialogue a bit. I use this image as an example of great art, and I do so without reservation. You’re correct that Bouguereau was a master painter, but he was also a philanthropist and a classical scholar. More than that, however, THIS painting is a treatise, a call to action that we can see when we think about the symbols within the work. It is interesting to note that Bouguereau used an ancient Roman copy sculpture purported to be of Homer as the basis for his painting of the man. It is now in the Louvre Look closely at the painting and the bust below and you’ll see the exacting reference. Homer, of course is “the Bard.” But he is more than that, he is the foundation of ancient Greek culture. The ancient Greeks knew and used the Iliad and Odyssey the same way modern Americans know and use the bible. And without Homer, there would be no ancient Greece as we know it. And without Ancient Greek culture, modern culture as we know it would not exist. Homer wanders through a wilderness. The painting is more than a superficial or fanciful record of one of his journeys. It is Homer as the symbol of the foundation of Western Culture surrounded by threat on every side. Wild animals. Cutthroat humans, even nature conspires to injure. Bougureau is telling us that Western Culture is as fragile as an old, blind man wandering in the wilderness. But look who is guiding Culture through this wasteland. It is Youth, armed only with a stone and Courage. He is dedicated to bringing Homer safely through. So the message I take from this painting is much more than a portrait of a journey. It is a call to us today, to the youth of every generation to be aware of the duty to bring precious culture forward through a threatening wilderness. This painting is a universal theme.